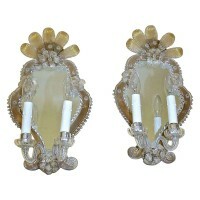 Pair of Venetian two-light mirrored sconces with clear and gold flowers and applied clear glass scroll decoration. Each sconce uses 2-40 watt max candelabra base bulbs. Newly wired.